One vendor of advanced editorial systems designed for today's and tomorrow’s Web publishing requires is Elektropost in Sweden. This system provides a Web master with a powerful, yet easy-to-use framework to build a wide range of applications, Web experiences, and interfaces. In addition, the EPIServer product allows programmers full access to Microsoft’s Dot Net framework to create rich applications for users. These applications can be deployed to minimize load on the server and exploit the power of today’s computing devices to minimize latency and processing bottlenecks. Programmatic optimization is a relatively new concept in SEO. Most optimization activities are a blend of software that “looks for” key words on high-ranking sites similar to the site that is to be boosted. Then a human — usually a relatively low-level professional at the SEO provider — manually makes changes to specific Web pages. In the early days of optimization when GoTo.com “invented” the pay-for-traffic model, this type of SEO worked. When GoTo.com became Overture and the distinction between “organic” traffic and “inorganic” traffic emerged from the often-confusing world of Web indexing, manual techniques were effective. Some of the software available today such as Web Position Gold and IBP8 are logical extensions of manual practices automated to a certain extent and quite useful for certain SEO tasks. The new generation of Web sites poses different problems to Webmasters. Now a single Web page is a software program. A Web site with as few as 50 pages uses a number of sophisticated techniques to expose and service a user. A glance at a “typical” page from a relatively modest informational site uses programmatic notions that only a programmer can love. 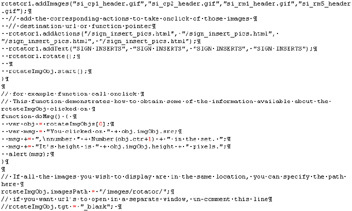 This type of Web page code blends standard HTML with a programmatic script. To a non-programmer, making a change to this script seems a formidable task. More importantly, an inadvertent change could create a fault that is difficult for an experienced programmer to troubleshoot. Tools such as DreamWeaver and FrontPage make many aspects of creating a Web page a point-and-click exercise. Modifying the underlying code of a Web page to improve a site’s relevance ranking on Google, MSN, or Yahoo is a more difficult exercise. Now consider a site that features secure and public information, handles images and possibly video, and presents real-time streams of data from Web log or news aggregators. Many pages contain functions that cause the Web server to create a page that is constructed in response to a user action. In fact, the notion of a static Web page is rapidly giving way to a view of a Web site as a collection of software modules that respond, often intelligently to user requirements. How does one manually optimize this type of Web site? More importantly, how many organizations know if their Web site is constructed in this manner? What is the underlying engine for the Web site? Is it a commercial system such as Vignette or a home-grown system built by the hosting company and running on Cold Fusion? Is the Web site hand-crafted with each page acting as a separate entity? These are now becoming important to companies, government agencies, and associations. Significant sums of money may have been spent on a Web site. Those involved have no clear sense of how to control the costs of maintaining the Web site. Senior managers want to know that the Web site is performing in some tangible way; for example, direct sales, inquiries from qualified prospects, reducing the costs of providing customer support. SEO has been embraced as one way to make a Web site show results — traffic, clicks, and a high Google ranking. The result is that SEO has become the equivalent of the village blacksmith. The craft is essential but difficult, time-consuming, and messy. The results may thrill a fan of Bronze Age metal work, but it is ill-suited to the demands of fabricating a part for a Honda Accord. Programmatic optimization is the process whereby changes in ranking factors are identified, fed into software, and propagates changes on the specific pages of a Web site where a modification is likely to produce a ranking benefit. A quality control process exists that automatically verifies that changes have been made. When errors are identified, these are sent via email to the supervising engineer so that adjustments may be made. ArnoldIT uses programmatic techniques in two situations. The first takes place when a Web site runs on the EPIServer or similar Dot Net architecture. The second takes place when a Web site is copied to ArnoldIT servers and operated upon globally by ArnoldIT’s programmatic scripts. Either way, the time and cost for addressing certain types of SEO issues is greatly reduced. Some sights, however, are “broken.” ArnoldIT can identify this type of problem for its clients and provide guidance on appropriate remediating action. When a “broken site” must be fixed, ArnoldIT can convert that site to a Dot Net compliant format and “bake in” certain features that enhance that site’s ranking. Why is programmatic SEO important? There are business and technical reasons. The business reason boils down to cost and payoff. Web sites cannot lose customers or consume more money than their owner can afford. The technical reason is that Web sites are not brochureware or the digital equivalent of an advertisement. Web sites are software. As software, specific engineering considerations must be applied to the site, its pages, and its technical environment. ArnoldIT can provide a forward-looking organization with the programmatic optimization services it requires. These services range from custom scripts to deployment of a Web site management system that works.